There is a feeling of great anticipation throughout the UK as selected exhibits for the Association of Guilds of Weavers, Spinners & Dyers national exhibition ‘Yarns in the Cathedral’ have been sent off, together with other packages of small bags. This is ‘delivery week’ and the unpacking and staging begins on Monday 12th May. The exhibition opens on Friday 16 May and is on until 1 June – see Association website for details. For some years this highly selected biennial exhibition has had a category for any Guild member to send in work, such an inclusive and encouraging element, and always so very interesting and varied too. Last time, the work had to fit in a 6 inch metal ring. This time it is for a small bag of no more that 8 inches in any direction. The usual criteria is still of meeting one of the disciplines of either weaving, spinning or dyeing. So with this in mind, and continuing to explore the potential for using paper yarns, I set to and set up my Ashford SampleIt rigid heddle loom with a paper yarn warp to weave the main fabric and lining, using plain weave and leno. 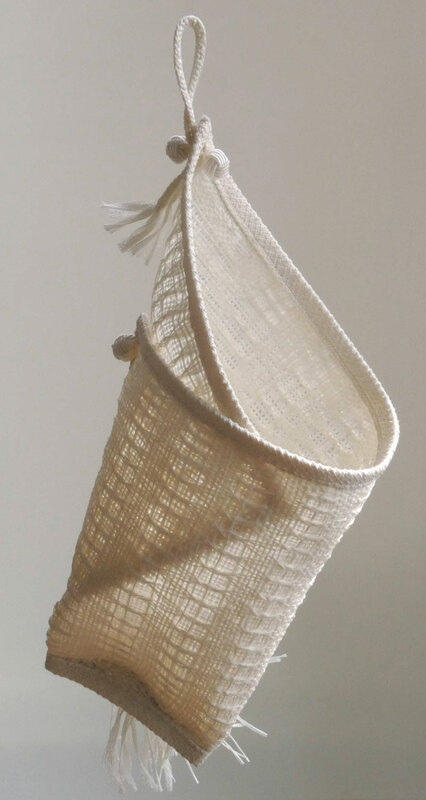 It wove extremely easily, the paper creaking somewhat as I placed the weft firmly each time, and it created a very light fabric with a gentle firmness. To bind the lining and outer fabric I made two braids on the takadai using the same paper and a silk woven bias tape. By the very nature of oblique interlacing, they turn the corners really well, and the two pointed starts gave me a lovely mitred join on a corner. I folded it many different ways, and eventually decided on a semi cone shape reminiscent of a hanging pocket. With a little marudai braided loop and some purchased gimp monkey fist ‘beads’, all was complete. I must do some more of this! It was so very easy to warp up directly from the cop and has a lot of scope…………….